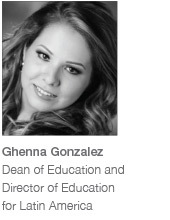 Striper brushes enable detail in this lovely design by Ghenna Gonzalez. Shape the nail using a 240/240 thin wooden file. Push back the cuticle and remove the shine from the nail plate with the Harmony 100/180-grit buffer. Apply Nail Surface Cleanse to remove any dust. Apply pH Bond to remove excess moisture. 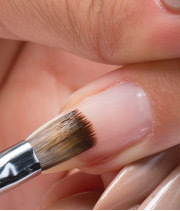 Apply a thin coat of Foundation Base Gel to the entire nail and cap the free edge. Cure in the Gelish 18G LED Light for 5 seconds or 1 minute in a 36-watt UV light. Using a #6 Gel Brush, wipe the surface of the cured Foundation Gel to remove excess tackiness. Apply one coat of Gelish Up in the Blue, making sure to cap the free edge. Cure in the Gelish 18G LED light for 30 seconds or 2 minutes in a 36-watt UV light. Apply a second coat of Gelish Up in the Blue, making sure to cap the free edge. Cure once again in the Gelish 18G LED light for 30 seconds or 2 minutes in a 36-watt UV light. 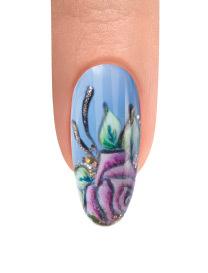 Using the Mini Gel Striper brush, pick up Gelish Arctic Freeze and create the outline of a floral design using short, quick strokes. Pick up more Gelish Arctic Freeze and create inner petals of the flower. Continue with the same technique and move inward toward the center to complete the outline of the floral design. Using the Mini Gel Striper brush once again, pick up more Gelish Arctic Freeze and create leaves around the floral design. 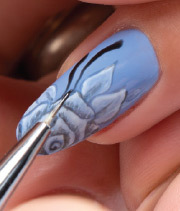 Wipe off the Mini Gel Striper brush and pick up Gelish Black Shadow and outline the white floral design. Create hanging branches that extend from the floral design using more Gelish Black Shadow. 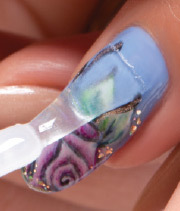 Using Gelish Stand Out, enhance the inside of the floral design using short, quick strokes. Using Gelish Copa Cabana Banana and A Runway for the Money, outline, detail and enhance the leaf design. 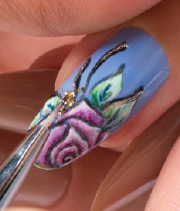 Using Gelish Oh What A Knight!, outline the floral design to create an enhancing glitter effect. Using Gelish All That Glitters is Gold and a clear #7 Gel Brush, add a glittering effect to the design. Apply a coat of Gelish Top It Off to the entire nail, making sure to cap the free edge. Cure for 30 seconds in the Gelish 18G LED light or 2 minutes in a 36-watt UV light. Remove the tacky layer using a lint-free nail wipe and Gelish Nail Surface Cleanse. Apply Gelish Nourish Cuticle Oil and massage into the nail plate.